What is Half Moon Pose? 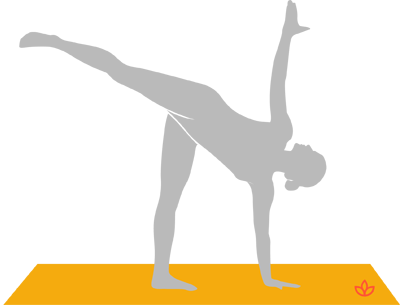 Half moon pose, or ardha chandrasana, is both a standing and balancing posture. With one foot rooted firmly to the ground, the other lifts toward the sky. The hands do the same; one hand rests on the ground while the other lifts toward the sky. The pose develops focus and concentration. Begin in warrior two pose with the right leg forward. Exhale and place your right hand's fingertips on the ground in front of your right foot. Inhale and lift your left leg toward the sky. Then lift your left hand toward the sky. Breathe normally while balancing in the pose. Avoid if you have low blood pressure.